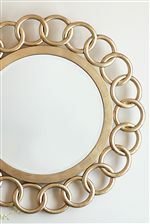 Simple and glamorous, this round mirror makes a chic statement. 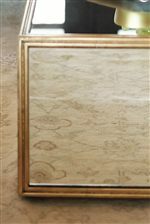 The wood frame is finished in a stunning Gold Leaf color, complemented by the polished beveled glass. Hang it individually or pair four together to update a traditional framed photo or hallway mirror decoration with upscale glamor. The Jet Set Round Mirror with Beveled Glass by Bernhardt at Malouf Furniture Co. in the Foley, Mobile, Fairhope, Daphne, and Gulf Shores, AL area. Product availability may vary. Contact us for the most current availability on this product. 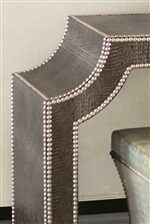 Finish & Paint Options A rich Caviar finish is used as a base finish throughout the collection. 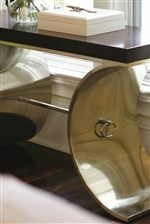 Steel bases and frames feature a Brass Plated finish, with an additional accent finish of Gold Leaf on wood elements. 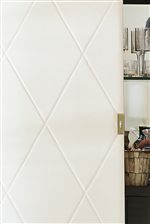 Handles & Hardware Heavy-duty solid brass hardware adds beauty and durability while reducing rattling, rusting and breakage. Ring pulls and other jewelry-inspired hardware can be seen throughout collection. 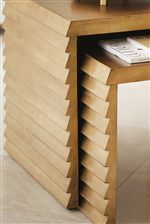 Case Detail Tapered and splayed legs, frame molding. Greatly influenced by 1940s French contemporary design, Jet Set is a glamorous whole home collection with an innate modern sensibility. The collection draws from familiar accessory materials and shapes like crocodile embossed and quilted leather, chain link designs, and shiny finishes that emanate the look of your favorite designer handbag or statement jewelry pieces. Simple silhouettes and ribbon-striped sapele veneers in a rich Caviar finish provide the platform for bold hardware and intriguing materials, ensuring each piece exudes luxe sophistication. From accent pieces to dining room and bedroom focal points, Jet Set is full of high-end, versatile pieces that can be mixed and matched and used in a variety of rooms in your home. Make a dramatic statement with one bold piece or layer on the luxury like you layer on bangle bracelets with the carefully curated and elegant looks from Jet Set. The Jet Set collection is a great option if you are looking for Transitional furniture in the Foley, Mobile, Fairhope, Daphne, and Gulf Shores, AL area. Browse other items in the Jet Set collection from Malouf Furniture Co. in the Foley, Mobile, Fairhope, Daphne, and Gulf Shores, AL area.